A wide tip can be related to a wide nasal base or due to a broad bulbous tip. Several techniques are available to slim wide, flared or thick nostrils using alar base reduction rhinoplasty. Many people are surprised to find out that the outer portion of the nostril region (also called the ala) does not have any cartilage in it. The outer alar margin and sidewall are made of fibro-fatty soft tissue. People with thicker ala don't have thicker cartilage, they just have more of this fibro-fatty tissue. This can create a more flared or wide appearance to the nasal base. The benefits of this technique is that very little, if any, skin is actually removed and the technique is technically reversible. Also the scar location just under the nostril and inside the nose hides very well and often much better than scars located further out in the alar facial groove where they are placed for the wedge excision technique. In some instances, it is best to combine a wedge excision with nasal sill excision to appropriately narrow the nostril area. This typically occurs when significant narrowing is desired. The skin around the nostrils has abundant oil glands and in some cases it is recommended to inject dilute steroid in the scar after surgery to improve the appearance of the scar. This is the case when the scar becomes overly thickened or hypertrophic. In other cases, the scar can be further minimized by performing dermabrasion (sanding) about two to three months after surgery. Dermabrasion can be done in the office with local numbing medicine. It acts to resurface the scar by removing the outer layers of skin cells and allowing new skin to grow in the area which creates a smoother appearance. The desire to create a more refined, elegant nasal tip is a common one. It is one of the most commonly requested changes that my patients bring up. There are a few common factors that can create tip bulbosity. The first is the nasal tip skin itself. Patients with thicker nasal skin tend to have more roundedness to the tip. In some patients the skin can be thinned conservatively. This is more common in non-caucasian noses where additional fibrofatty tissue can be removed. The second common cause is the tip cartilages themselves. The lower lateral cartilages may be too wide, convex, or both. One of the features that can make a nose look too big, especially from the profile view, is having an overly long, or over-projected tip. Tip projection refers to how far forward the nose travels from the face. Rhinoplasty can be used to treat a long nose by repositioning or trimming the tip cartilages. At the same time care must be taken in creating a seamless, well-balanced profile to coincide with the new tip position. As a result, de-projecting an over-projected tip may also involve shaving down excess cartilage or bone from the bridge. The droopy or ptotic nasal tip can be a problem that occurs with aging as the nasal tip support becomes weaker. In other cases, the tip may point downward naturally or due to trauma. In any case, rhinoplasty can be used to reposition the tip in a more up-turned or rotated position. If the problem is related to a damaged caudal septum this area can be rebuilt with cartilage grafts. Sutures can also be used to secure the tip in the newly elevated position. Care must be taken when rotating a drooping tip to avoiding a too upturned tip, especially with male patients in whom such a manoeuvre would tend to feminize the nose. A narrow or pinched tip can be related to tip cartilages that are inadequately spaced apart or collapsed. This can occur naturally, or more commonly can be due to prior rhinoplasty surgery where the nasal tip cartilages are overlying resected and weakened. Another cause of a narrowed tip is that the tip defining points were placed too close together. 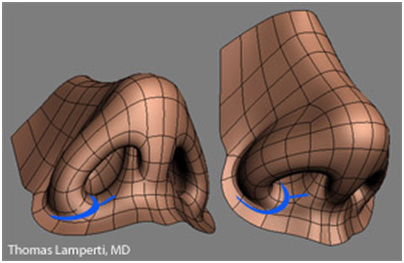 The treatment of tip pinching focuses on recreating the proper cartilage support of the nose.